The same applies for delegation of tasks. Some people are faster, some need more time to pass a certain phase. You need to tell the people exactly what they need to do, step by step. During a leadership seminar, I took, the trainer explained it with playing soccer. At the beginning you tell the players where to place their foot best to shoot the ball where they want it to – do the things right. Step back from the field and let the player turn into practice what they’ve learned. Tell them more general things and see if they do the right things. If your people know how to do the right things right, start to coach them. Support the development of their own thinking and solutions. Encourage them to try their own ways. Develop their personal skills, not the technical skills so much anymore. Be their backup in case of questions or trouble. Delegation is to pass on tasks or projects that are actually yours. It is not to pass on work. 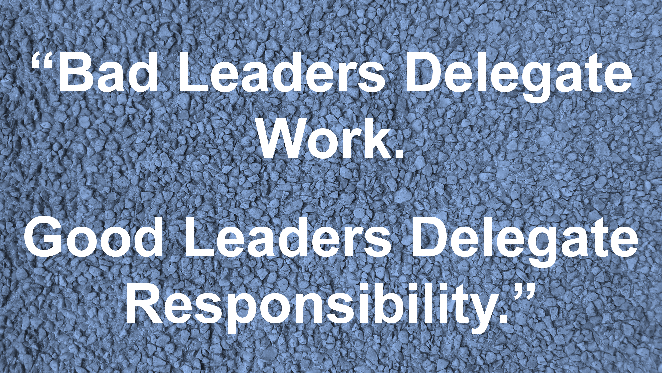 It is to pass on responsibility: Bad leaders delegate work. Good leaders delegate responsibility. Read my article for further instructions on how to delegate. What’s your experiance on this topic?